To kick off 2018, I thought I’d give you a challenge. For a 30 day period, your challenge is to work on, and improve, your weakest stroke. And I mean really work on it. During any table tennis training session you do over the 30 days, you have to spend a good chunk of time practising this weak stroke. It can be any stroke (flick, topspin, block, smash, a serve etc), but it should be something you really struggle to use in match-play. A shot you are far more likely to mess up, than get on the table. The whole purpose of this is to use focused, deliberate practise in a condensed time period (30 days) to transform your weakest stroke into something which works in a competitive match. I think it can be quite easy to ignore a weakness. During training sessions, it’s usually more fun to use the shots you’re good at (which makes you feel good), rather than trying to improve the shots you’re not good at (which can make you look rubbish). But this can limit how much you improve. It’s important to work on weaknesses, in a focused and deliberate way, as well as practising your stronger stokes. When you improve your weakest stroke, your entire level rises. 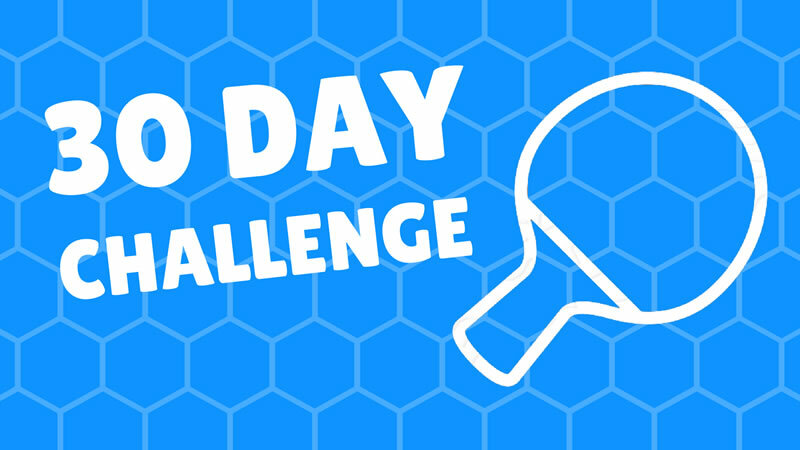 What can you achieve in 30 days? Realistically, you probably won’t transform your weakest stroke into a major strength in 30 days. It’s likely to take much longer than that. But the purpose of this challenge is to start the process of transformation. 30 days is plenty of time to make technical improvements, practise the stroke lots and lots, increase your confidence in using the stroke and hopefully turn your biggest weakness into something which works better. By the end of the challenge, if you are able to use the shot successfully in a competitive match, this will be a success. Ideally, you’ll need a minimum of 10 hours practice over the 30 days. This is roughly 2 to 2 ½ hours per week. But it will be great if you can do more than this, if you have the time. The more you practise your weakest stroke during the 30 days, the bigger the improvement you’re likely to experience. It doesn’t really matter when you do the challenge – January, February, March etc – as long as you do it some point this year, when it is convenient for you. So my 30 day challenge will be to improve my backhand topspin against a backspin ball. I consider this my biggest weakness at the moment. I can play the shot in regular drills and irregular drills (although not so well). But in a competitive match, I tend to get a bit scared and don’t use the shot. I find myself pushing, instead of topspinning, even if the ball is a bit loose. If I do go for the shot, I tend to tense up and play a very weak topspin which usually ends up in the net. This has been going on for years and I’m determined to do something about it in 2018. This will be enough to get me started. I may add different drills throughout the challenge, depending on how I’m progressing. What’s your weakest stroke? What have you avoided improving over the past 2-3 years? If you know what your weakest stroke is, but have no idea how to improve it, then try to get some advice from a more advanced player or a coach. If there is a big technical flaw which is causing the weakness, you need to address this. If you practise the weakness still using the big technical flaw, you’ll simply be reinforcing the weakness. So get someone to take a look at your technique, so you are trying to practise the right thing. Write down a list of drills you can do to practise the shot. They don’t need to be complex drills. Often simple drills are the best. But I do think it is a good idea to combine both regular drills (you know where the ball is going) and irregular drills (play is more random). Then get to the table and practise, practise, practise. Keep doing this during all your training sessions for a 30 day period. I’ll write another blog post when I have completed my challenge. I’ll share my progress, and hopefully success, in using my backhand topspin in a competitive match. If you decide to do the challenge too, please let me know how you get on.